I worked all morning dyeing up a batch of skeins in Butterscotch, Fuzzy Peach, and BCA Pinks. 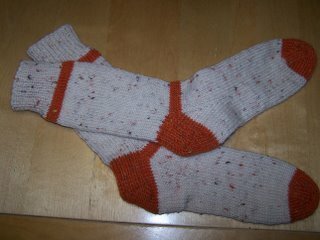 Took a break for lunch, and then did the finishing touches on the skeins. Got them all re-skeined, tied and nicely draped, ready for the trip downstairs to dry. 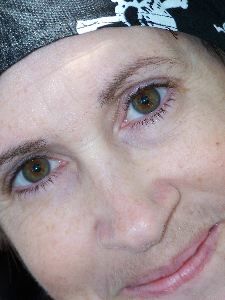 Spent some time with my feet up reading blogs. Seems I see those Project Spectrum posts and buttons wherever I go. I punch a button to see what's up. A project all about creating with colour? Why wouldn't I want to participate? And then I look to see which colours are currently featured. Green. My favorite colour of all. And Yellow. And Pink. I laugh out loud. It was meant to be. And speaking of yellow. And Orange. 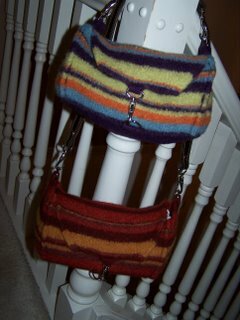 Hop on over to Trish's blog and check out the sweet felted bag she made with a skein of dyed yarn she bought from me. Oh I am so proud! Trish did a beautiful job on her bag, and the yarn colours did a happy dance in the knitting. 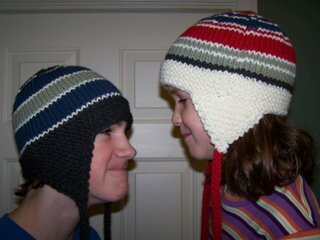 This is the first finished project I have seen made in SJK yarn. Posted by jayne at 9:36 p.m.
Jayne, I love what the yarn did on Trish's bag. I don't think I could've brought myself to felt it if I accidentally got such a cool zigzag (although it does look nice felted as well). Someone on Trish's blog said the bag was spicy, and I agree. Trish sure had an eye for how to design that bag with the funky button and terrific liner. Artistic woman, that Trish.